Once upon a time, in Hollywood, there lived a man named Mr. Cinders. He "kept a little dress shop in a quiet but elegant part of town. People came from far and near to buy clothes from him because he made such lovely things." He and his daughter did, that is. Her name was Ella, and she had red hair. The two had become very close since Mrs. Cinders died. Ella had learned everything about the dressmaking trade there was to know. All about "silks and wools and satins and and how to coax them into coats and dresses." By the time she was a young lady, she was the best dressmaker in town. The only other member of the shop's staff was a young man called Buttons. This name was because he had three of these on his jacket. The rest of his uniform was a pair of "trousers with gold stripes down either side and a round cap set at a jaunty angle." He opened and closed the door for people, and polished its windows. In between odd jobs, he and Ella used to share jokes. He could always tease a laugh out of her, no matter how busy the day. Their life was happy until suddenly, things changed. Her father found a new wife. The lady's courtship with her father happened so fast that Madame Reneée "seemed to pop up from nowhere like a sharp-eyed, expensively dressed jack-in-the-box." Before Ella knew what was going on, her stepmother changed everything at the dress shop. Worst of all, she put her two daughters, Ruby and Pearl, to work as models. Ella had to make all dresses to their size. Those two were as hard and thin as a pair of willow switches, while Ella was as sweet and plump as a marshmallow. None of the clothes she made for the shop fit her, now, and she had no time to make more for herself. Her black dress was soon in tatters. Ruby and Pearl, and all of their cosmetics and wardrobe, required space to spread out. Lots of space. They took over Ella's room and made her sleep in the basement. Her only friends were Buttons, and an old gray tomcat. Mr. Cinders saw that this was happening, but seemed too tired to protest. Where had his love for his child gone? Buttons kept a close watch on Ella, and often visited her in her basement quarters. 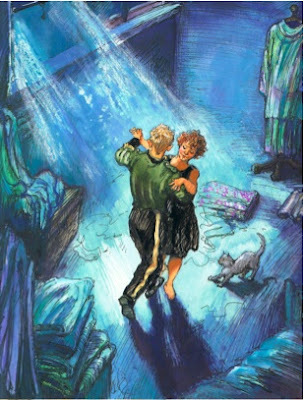 When the moon was full, the room was flooded with light, and Ella and Buttons danced beneath its silvery glow. The richest and most glamorous customer who came to the Cinders Dress Shop was the Duchess of Arc. She "always arrived in her luxurious car and swept into the salon, swathed in furs and sparkling in superb diamonds." One day, the Duchess announced that she would be hosting a grand ball, "at her villa, in honor of her son, the Duke of Arc. All the ladies and gentlemen of any importance in the neighborhood were asked to attend." How Ruby and Pearl began to scheme over the evening! But when Ella asked, "Will I be going too?" her stepmother snickered. "You? Go to the ball? No chance, Carrots, you're far too shabby. Besides, you couldn't possibly get into any of the dresses.." Ella thought this was a mean answer and she said so. All she got for her troubles was a scolding. The big night arrived, and the three stepfamily members departed. As Ella's father passed her in the hall, he offered a feeble excuse. "You see how it is. There's nothing I can do." This was, of course, not true, but Ella knew it was pointless to protest. She slumped down in her dark basement, "and gathered up the old gray cat into her lap. 'I'll bet it's a horrible, stuck-up affair anyway. But oh, puss, I would have loved to have seen it all!" That's when she heard a voice. It said, "I'm cooking bacon and eggs in the kitchen. Come on, we'll have a party of our own!" It was Buttons, and oh, how glad Ella was to see him. But just as she stood up, she realized that there was someone else in the room. It was a person with an umbrella, and she said," I am your Fairy Godmother. It's my job to see that you go to the ball, so let's not waste time." And with that, she led Ella, Buttons, and the cat outside. There wasn't anything that looked like it could be magicked for a vehicle, Then she saw the bicycle that Buttons used for deliveries. It would do. The Fairy waved her umbrella over it and "it instantly turned into a large, gray, gleaming limousine." Next the umbrella was aimed at the cat, who became " a smart chauffeur, dressed in an immaculate dove gray uniform". He opened the door for Ella, but she did not get in. "I can't go to the ball like this. I look terrible." she said. So her Godmother "sketched a shape in the air with her umbrella, and suddenly, Ella was dressed in a ball dress as light as a silver cobweb, glittering all over with crystal beads, which fitted her perfectly." A little silk hat to disguise her head, and a pair of glass dancing shoes, and she was ready to go. "Be home by midnight!" warned the Fairy Godmother. Ella promised that she would, and the chauffeur pulled away. Buttons suddenly found himself all one. "Now there's nobody left to share the bacon and eggs, not even the cat." he said aloud. And he went back, all alone, into the shop." At the ball, all eyes turned to Ella. The Duke danced number after number with her, and the evening flew by in a jiffy. And before it seemed possible the clock began to strike. One! Two! Bong, Bong, Bong. Ella fled. "I don't even know your name!" called the Duke, but she did not stop running. When Ella got back to the shop, she was in rags again, but she still had a glass shoe on her foot! The other she had lost, somewhere between the villa and her home. Later on, Pearl and Ruby breezed in, full of gossip. Something about a mysterious lady, and something about a glass shoe. Ella was dying to hear the details, of course, though she couldn't let on. So she had to wait until the next day, when the sun was high in the sky and those two lay-abeds got up, to hear more. That's when she learned that the Duke was conducting a search for the girl who could wear the glass shoe he had found on the stairs! He must find her, he had said, because although "he had been accustomed to the company of the most charming ladies in Europe" he had never met anyone so intriguing as the girl in the silver gown. But though the Duke and his men searched far and wide, and girls and women of all shapes and sizes tried the little glass slipper on, it seemed that no one could wear it. At last the Duke's retinue arrived at Cinders Dress Shop. Here Ruby and Pearl "pushed and shoved and pleaded and squashed up their toes" but still, the shoe would not fit their feet. Their mother "who had been peering intently over their shoulders like a beady-eyed bat trying to capture a worm, could hardly contain her rage and disappointment." Just then, the Duke noticed a servant girl, but something about her appearance tugged at his memory. "Will you try it?" he begged her. Madame Renée and her daughters snorted with laughter. So Ella sat down and put on the shoe. Then she "produced the other matching slipper from her pocket" and the whole gang was "stunned into silence". The Duke told Ella that he had been afraid that he would never find her, and that he did not want to lose her again. He held her hands and looked tenderly into her eyes, and asked her to become his wife. Ella looked around her. She saw that the faces of Pearl and Ruby were "ugly with envy and bad temper." And she saw that Buttons, good, kind Buttons, had turned his face away. He was "hovering in a corner, pretending to be very busy tying up a brown parcel." Ella smiled now, and hugged the Duke. "Thank you very much," for the proposition, she told him, she was absolutely thrilled. But, since she happened to be in love with Buttons, she most respectfully declined. Now "Mr. Cinders started to smile for the first time in a long while." Of course Madame Renée tried to talk the Duke into accepting the hand of Ruby or Pearl but that young man only "shook his head politely and hurried away from the house as fast as he could. Soon, it was rumored, he had taken off in his private airplane to explore the South American jungle, and recover from his broken heart." But Buttons and Ella were married next day. They lived on bacon and eggs while they saved enough money to open their own little dress shop, and lived together happily for the rest of their days. From Ella's Big Chance: A Jazz-Age Cinderella (Kate Greenaway Medal (Awards)) . Notes: This author is so wonderful; her illustrations show real people, and remind me so much of the delightful baby board books she has also done. In the notes and dedication page, we learn that the pictures were done in "gouache color combined with pen line". Also that "the ball scenes were inspired by the dance sequences in the R.K.O. Fred Astaire/Ginger Rogers movies." The dresses in the book were designed by the author as well, inspired by "the French couturiers of the 1920's such as Doucet, Poiret, and Patou." 1. Read the book and look carefully at the clothes, the cars, and other clues for what year the book is set in.